You would never know that the end of the 1960's would bring the end of US-production of Hamilton watches. The company appeared to be going as strong as ever as more and more new models were introduced every year. Hamilton didn't close up shop entirely in 1969. It just formally declared that manufacturing would be centered in Switzerland. In fact, a number of 1960s models continued to be produced into the 1970s. Anyway, one of the new models in 1965 was the Accumatic A-605. It was produced through 1969. The A-605 came in a 10K rolled gold case, as you might guess since it's 600 series model. 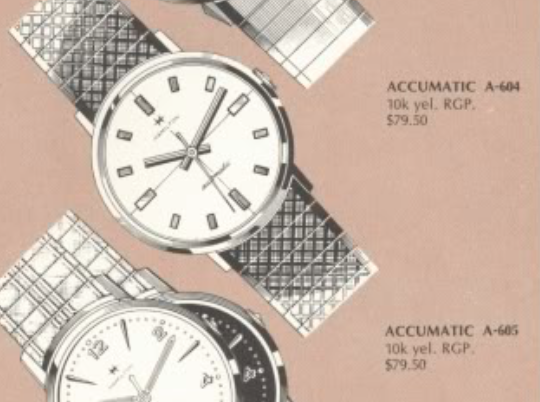 The Accumatic line had a variety of classic 1960's designs with case materials ranging from solid gold to stainless steel and all sorts of unique dial designs in white, gold, silver, and black. The A-605 came with a radial finished white dial with golden rectangular markers. Like most models at the time, it was paired with a special bracelet. Tucked inside the case is an ETA-based Hamilton 689A automatic movement. My project watch came to me from a follower of the blog. It was a family piece and even though it looked pretty beat up, it had great sentimental value. It's definitely worth restoring. A lot of the Accumatics open through the crystal and the A-605 is no exception. It's a one-piece case design so the only way water can get is in through the stem tube or around the crystal. With the beat up crystal out of the way, you can see that the dial is in good shape overall but there's a little discoloration around the 5 marker where moisture got past the crystal. There's nothing I can do about that now though - other than treat it very carefully so I don't make it worse. The movement looks pretty good too but there is a little evidence of rust. It's definitely very dirty and time for a thorough cleaning. Everything is taken apart and thoroughly cleaned and dried. I only saw one watchmaker's mark inside the case back... so I know I'm not the first person to take this watch apart.. The balance is now swinging away, as evidenced by the blur of balance as captured by the camera. Let's see... it's running a little fast, the beat error is a little high and the amplitude of 181 degrees is a little low. The amplitude could be caused by the fact that I didn't wind the watch very much. First I'll tackle the beat error, then the beat rate and finally, I'll wind the watch more fully and see what the amplitude looks like. A tweak to the position of the hairspring stud lowers the beat error to 0.6ms. Anything less than 1.0 is great, in my opinion but I can probably tighten it up a little more. There... 0.1ms beat error, 7 seconds fast per day, and an amplitude of 233 degrees. There's nothing to complain about with this performance. I like to leave watches running a little fast. They slow a little bit over time. This crystal has seen better days. The preponderance of scratches, the fact that moisture has gotten past it, and the yellowish colors are all good reasons to replace it. A 29.5mm high dome crystal will do the trick nicely. And here's the finished project, paired with a nice genuine lizard strap. You can still see the spotting on the dial by the 5 but hey, lets face it, most people from 1965 have a few spots too by now. One thing that's interesting about the case is the shape of the lugs. You can't tell from the front but they have an interesting "claw-foot" like shape to them from the sides.